Alien Skin Software has just released Exposure 6 - a series of film stock filters. Exposure 6 is a plug-in for Photoshop and similar products including Lightroom as well as a standalone program. 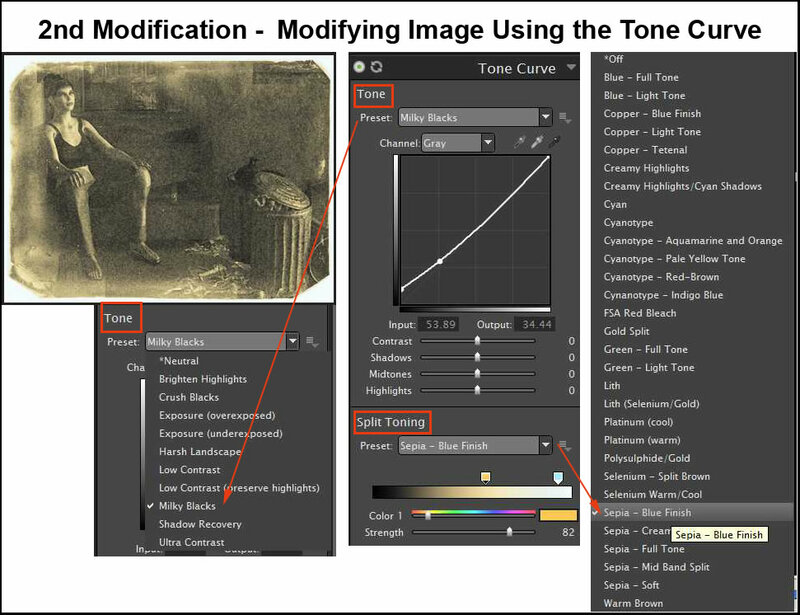 It changes the look of ordinary images by applying film stock filters. However, it goes way beyond just doing that. Not only can you choose many varieties of films to use to modify your image, but each type of film has many presets. Any of these can be modified by changing the focus, film grain, etc. Once again, the availability to modify your image doesn't just stop there, for these adjustments also contain presets. 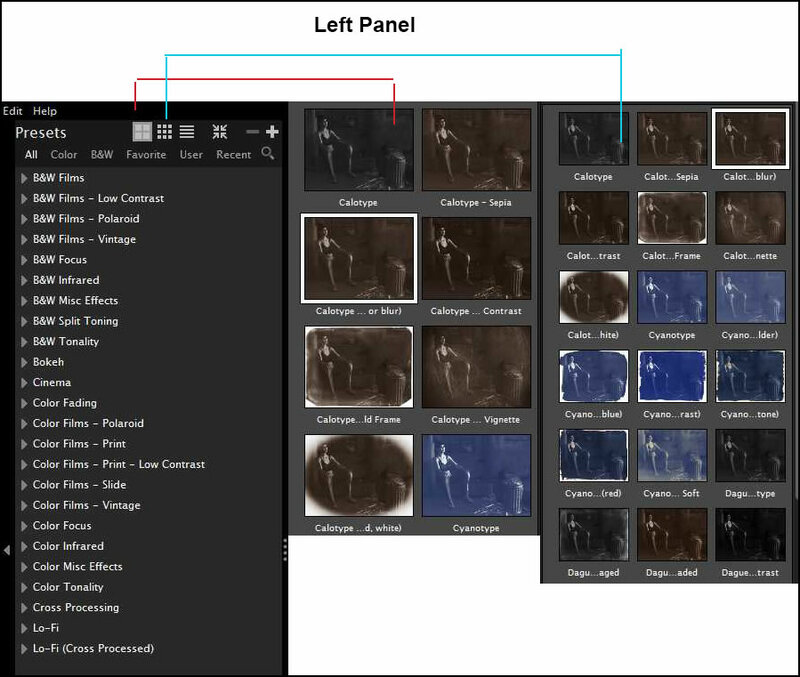 A new basic control panel with sliders to control many elements of exposure such as vibrance, contrast, etc. Full size instant previews are really instant. New borders, light effects, and textures including ones you have created externally. A new UI including many ways to view the presets such as lists, thumbnails, etc. as well as a dark color to emphasize your images. The support for Apple Retinal display. Exposure 6 costs $149.00 with upgrade pricing available from both previous Exposure products as well as Bokeh and Bokeh 2. You can, also, download a free trial. 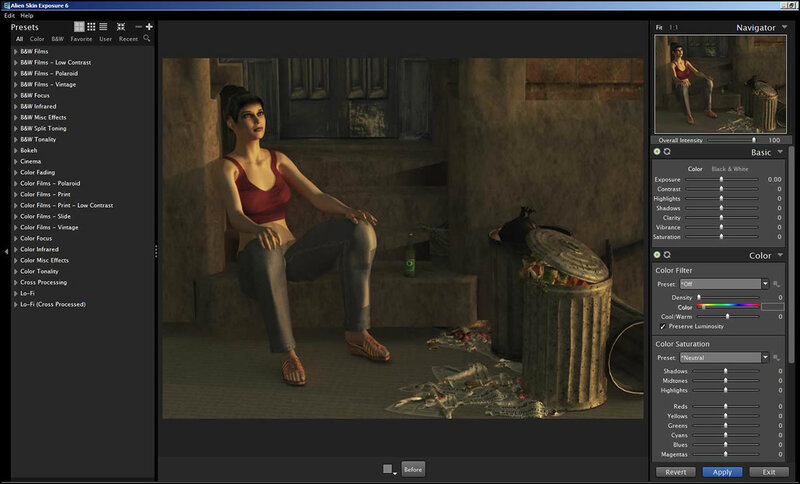 To review Alien Skin Software's Exposure 6, I used Photoshop CC on a Windows 7, 64-bit machine with 32 MB of Ram. The size of each image that I used for demonstration and testing purposes was about 40 MB. I used previously finished images I created in Vue Infinite as well as photographs to which I added various effects using Exposure 6. The interface is clear and very easy to use. 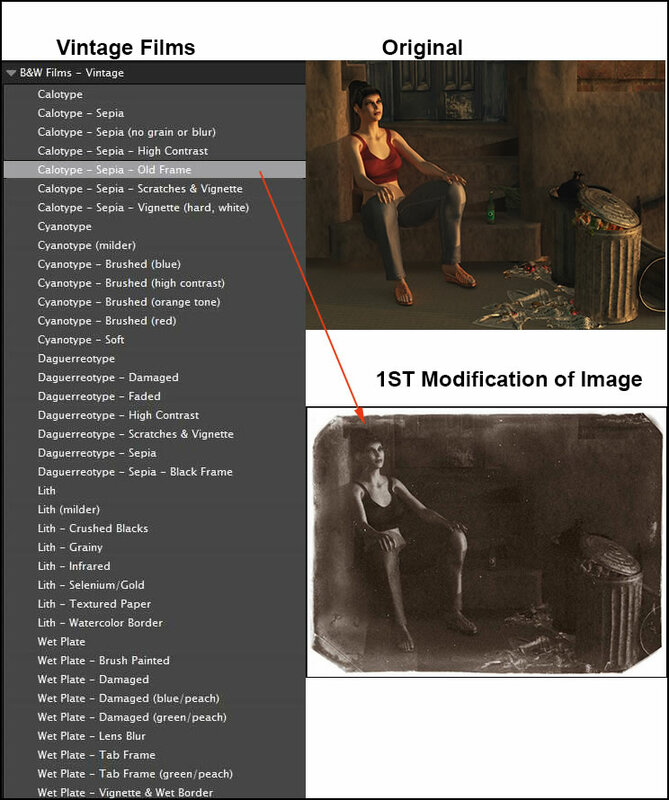 It is divided into three sections: a left panel that contains the basic film presets, the center canvas for your image, and the right panel which contains the myriad of modifications available. At the bottom are choices for viewing the finished work consisting of various views of the Before and After effect. While I know one can download a free trial, I personally find it useful in a review to look at the options beforehand. Below is a screen captures of the left panel. And below is a screen capture of the right panel. You can use either presets to control the changes, do them manually, or combine the two. Once you find an effect that you particularly like, you can save it as a preset. The following two screen compilations demonstrate how an image can be modified. I decided to turn the original image into an old discolored one. First I chose Vintage Films from the major presets. Then I selected the type of film I wanted to portray. You can only choose one type of effect (such as Vintage) at a time from the left panel, but with the right panel, you can make as many modifications as you like. Next I decided to use the Tonal Curve on the right panel to demonstrate the number of both presets that can be used and manual modifications that can be made. Using another image, I decided to work more artistically. I turned this older looking scene into an old photograph. I guess I tend toward liking to create old beat up looking photos. For my next few demonstrations, though, I will create different types of effects. 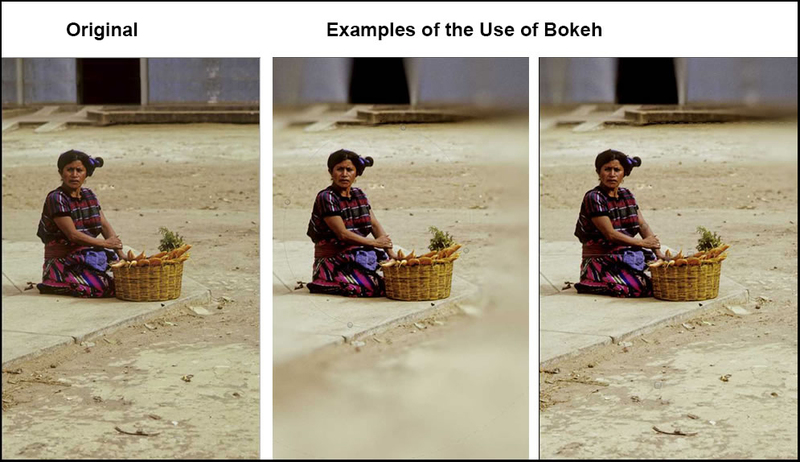 You can use the Bokeh component to create areas of blur in an image. The choices for how you set it up are too numerous to demonstrate. First I chose a film type not very different from my original image. For the Bokeh effect, I chose a standard 85 mm lens and then placed masks on the image. In the first I used an oval mask and in the second I used a linear mask. These masks can be found on the right panel within the Bokeh effect. The blurred area in the middle image is distracting, but it demonstrates my misuse of the effect. The last image is more traditional and I find more pleasant. Interactive images can be found on the Alien Skin Software's website. Sometimes the changes are very dynamic and sometimes very subtle. The control available in Exposure 6 is extremely good. You can create an image just using a type of film or modify that film to create your own special effect. One cannot stack film presets (left panel), but you can stack modifications (right panel) to create unique effects. For information on this product as well as other Alien Skin products, go to their website. You can purchaseExposure 6 as an individual product or within a Photo bundle containing Exposure 6, Snap Art 4 and Blowup 3. This bundle is an excellent money saving choice. For new users it costs $199. However, if you own any individual current product in the bundle or Bokeh 2, it is $119. You can find my review of Snap Art 4 by clicking on the link. I personally recommend purchasing the bundle. 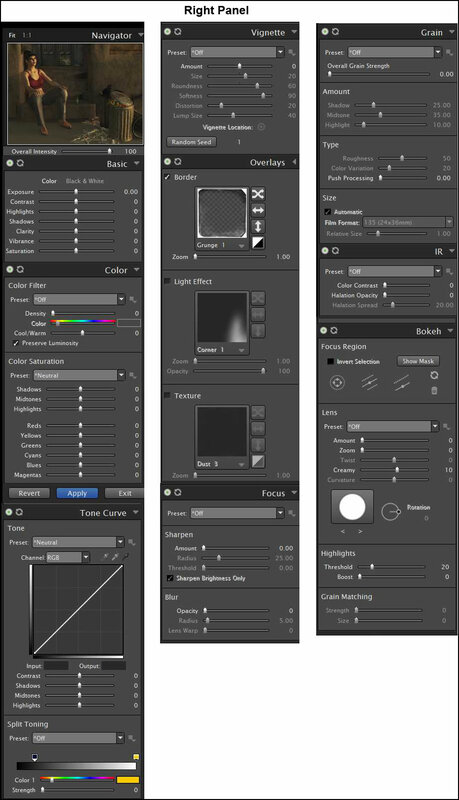 If you are not sure how to use Exposure 6, Alien Skin has provides a number of tutorials for it as well as for their other products.